The fall often heralds the spread of avian flu in the Northern Hemisphere, which can often be carried long distances by migratory birds. In recent weeks we’ve seen outbreaks in France and Germany, and so all of Europe is on alert for signs of encroachment. From the Federal Service for Veterinary and Phytosanitary Surveillance of the Republic of Mordovia and Penza region (Rosselkhoznadzor) we are notified of a recent detection of avian influenza in a wild duck from Zagorsk, in the Moscow Oblast region of Russia. It is not clear from this report what subtype (or even pathogenicity) has been assigned to this finding, although HPAI H5N1 and HPAI H5N8 are two likely suspects. Hopefully we’ll get a more detailed report when the OIE is notified. The most recent Russian OIE report (on H5N1) was submitted in August. Office of Rosselkhoznadzor for Republic of Mordovia and Penza region informs that during FGBI "ARRIAH" 11/24/2015, the laboratory testing of samples of biological material from mallard ducks, owned by OAO "reserved hunting" Zagorsk "(Moscow region, Sergiev Posad District, .Malinniki), identified a gene of influenza A virus subtype H5 bird. During the period 2014-2015,. Highly pathogenic avian influenza was detected in 36 countries. In 2015, a sharp aggravation of epidemic situation of highly pathogenic avian influenza, both in Asian and European countries. The threat of the risk of bird flu foci associated with the formation of natural outbreaks in wild birds and poultry anthropogenic complex can serve as a vector of transmission of the virus in poultry. The tense epizootic situation for highly pathogenic avian influenza in the world and six cases of detection of highly pathogenic avian influenza R5N1 in wild birds in 2015 in Astrakhan and Novosibirsk regions, the Republic of Tuva and Trans-Baikal Region indicates that the threat of drift of influenza virus in poultry and Distribution in Russia is extremely high. 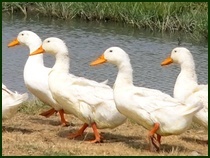 All citizens have in his possession in poultry in areas at high risk of contact with wild waterfowl, it is necessary to carry out preventive vaccination of birds against flu.